Awake & Moving: Sneaker Heads Gather To Honor Their Love For Shoes. Sneaker Heads Gather To Honor Their Love For Shoes. Sneaks UP at Cowboy's Dancehall, April 30, 2017. It's that time of year again, everyone! 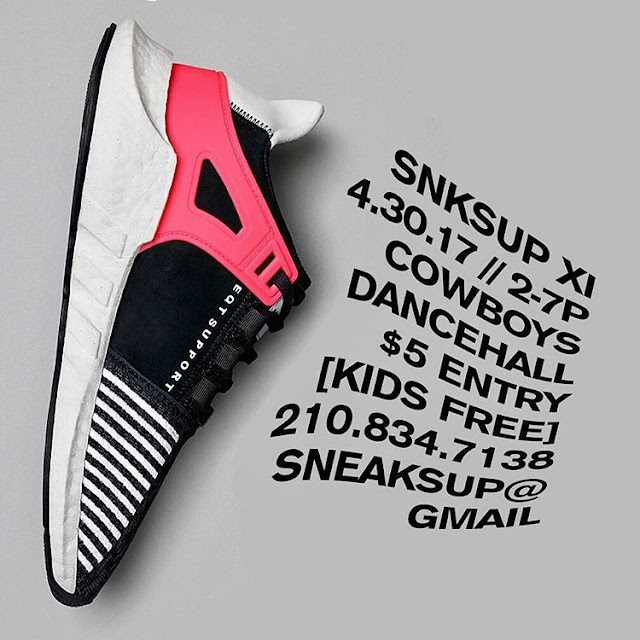 When sneaker heads from all over the great state of Texas convene on the Alamo City for a celebration of all things sneakers and street culture. Last year was so much fun and I always have a blast at Sneaks Up. Though I won't be in attendance this year, as I will be out of town, I urge you all to go hit this up! If you care about sneakers or hip hop or streetwear, this is the move for the weekend. There are always a ton of raffles, great music, and plenty of smiles from kids to adults. Sneaker culture transcends shoes and brings together a wide range of people from within the varying sub-communities of street culture. Be there this Sunday and experience what I am talking about firsthand at Sneaks Up and be sure to tell them you heard about it from Awake & Moving.